Chinas huge environmental challenges are significant for us all. They affect not only the health and well-being of China but the very future of the planet. In the second edition of this acclaimed, trailblazing book, noted China specialist and environmentalist Judith Shapiro investigates Chinas struggle to achieve sustainable development against a backdrop of acute rural poverty and soaring middle class consumption. Using five core analytical concepts to explore the complexities of this struggle - the implications of globalization, the challenges of governance; contested national identity, the evolution of civil society, and problems of environmental justice and displacement of environmental harm - Shapiro poses a number of pressing questions: Can the Chinese people equitably achieve the higher living standards enjoyed in the developed world? Are China's environmental problems so severe that they may shake the government's stability, legitimacy and control? To what extent are Chinas environmental problems due to world-wide patterns of consumption? Does China's rise bode ill for the displacement of environmental harm to other parts of the world? And in a world of increasing limits on resources, how can we build a system in which people enjoy equal access to resources without taking them from successive generations, from the vulnerable, or from other species? China and the planet are at a pivotal moment; transformation to a more sustainable development model is still possible. But - as Shapiro persuasively argues - doing so will require humility, creativity, and a rejection of business as usual. The window of opportunity will not be open much longer. Judith Shapiro is a Professor in the School of International Service at American University, Washington DC. She is the author of Mao's War against Nature and the co-author of Son of the Revolution and other books on China. The Second Edition has been thoroughly updated with the latest figures and trends, and it has been expanded in significant ways. It incorporates Chinas encouraging shift on climate change and peak emissions and its stringent new environmental laws, as well as the 2015 Under the Dome viral video phenomenon. The chapter on civil society has been reorganized and updated so as to highlight the many inventive and courageous strategies that Chinese environmental non-governmental organizations are using to shape public policy and behavior. Finally, there is an extensive new section on the global impacts of Chinas resources quest. "This revised edition has much to offer students of China’s environment." "Judith Shapiro has given us an indispensable book: Vibrant, levelheaded, and up-to-the-minute, the new edition of her superb chronicle of China's environmental struggle encompasses both the global impact - reaching from Alberta tar sands to Kenyan farms - as well as the nuanced domestic politics that will shape the future. Amid her sober accounting of today's crisis, she gives us reason to hope that a country that can "make rivers flow uphill," as a Mao-era poem put it, may play a vital role in tackling climate change." 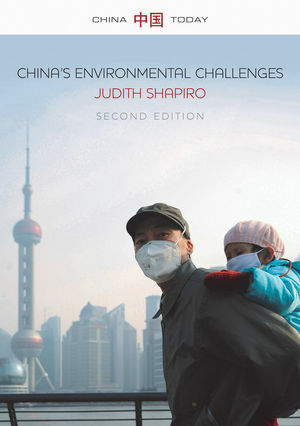 "In this revised and updated edition, Judith Shapiro continues to show why she is one of the foremost experts on China and its environmental challenges. She provides an insightful and accessible account of the drivers of pollution in China, its consequences for all of us, and the needed national and international reforms to address these pressing problems. Highly recommended." "The scars from China's economic rise run deep through the earth. Yet, as Judith Shapiro reveals, China is starting to surprise the world by pursuing some innovative, even farsighted strategies to try to slow the escalating global environmental crisis. Understanding the potential of China to do both great harm and great good is essential for anyone searching for pathways toward a more sustainable future. No other book offers such a skilled and subtle analysis of this potential as the second edition of China's Environmental Challenges." "There is no better book available [In English] on evolving environmental policies, activism and struggles in China from the 1990s to 2015. It is highly recommended"